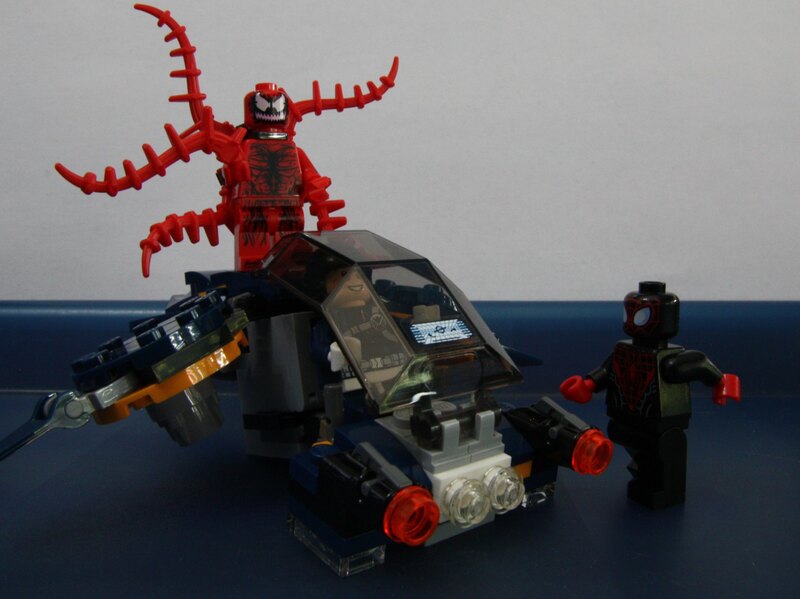 Carnage has broken out of prison and the SHIELD agent is in hot pursuit to recapture him. 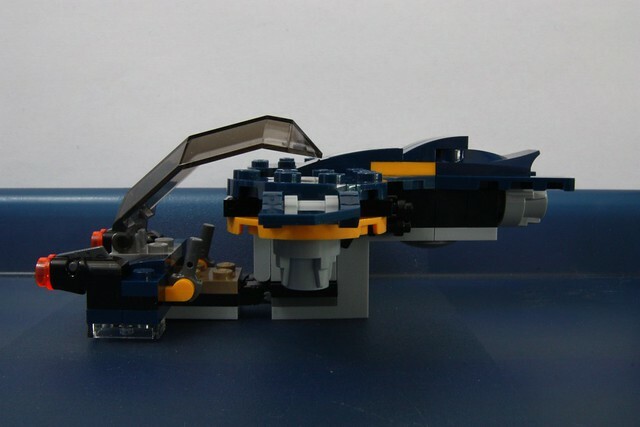 Place the SHIELD agent in the jet flyer’s cockpit, adjust the wings and soar into the sky. 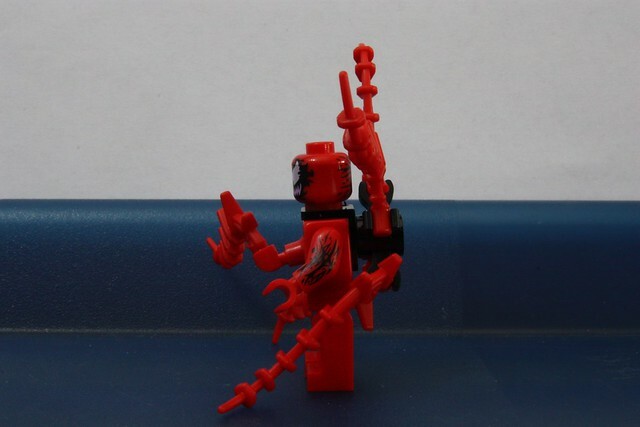 Fire the stud shooters to try and repel Carnage’s tentacular aerial attack! 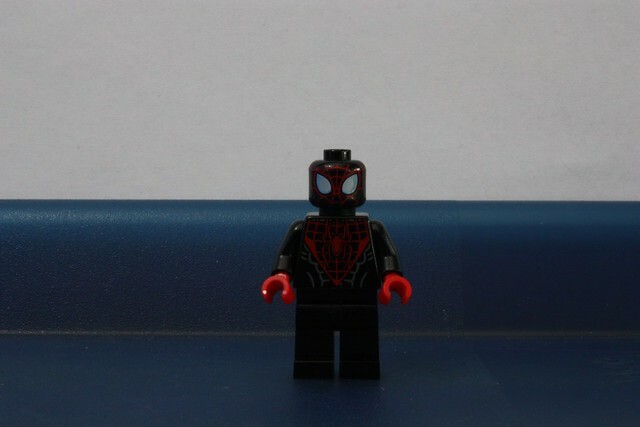 Luckily, Web-Warrior Miles Morales Spider-Man has swung into the LEGO® Marvel Super Heroes universe to help contain this creepy super villain. Topple Carnage with super-jumping Spider-Man and save the day! 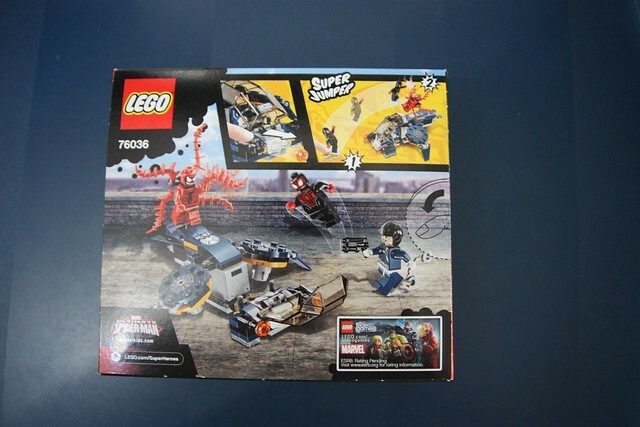 Includes 3 minifigures with a weaponelement and assorted accessory elements: Spider-Man, SHIELD agent and Carnage. FINALLY! 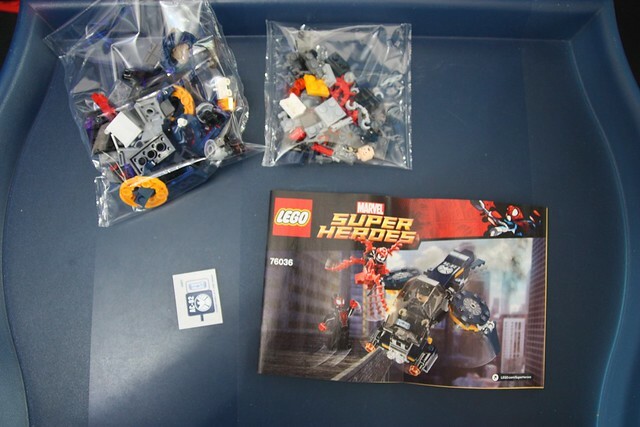 After four years of seeing spiderman sets as part of the Marvel Super Heroes, we get a different version of Spiderman! Its been a wait, yet this year we actually get TWO versions. It's nice that Lego have finally addressed the fact that Spiderman is not just one person. But a new Spiderman figure isn't the only highlight of this set. Let's have a look at what else we get. First off, the box. It's the standard affair, with an action shot showing off our characters and the build. 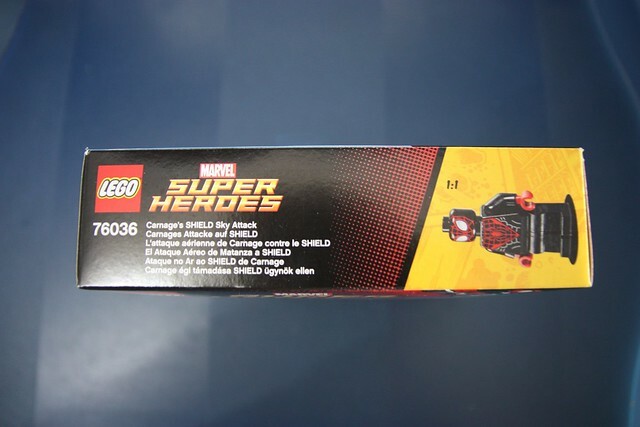 The back of the box gives a second action shot of the vehicle on the ground, our plucky SHIELD Agent isn't so scared now. 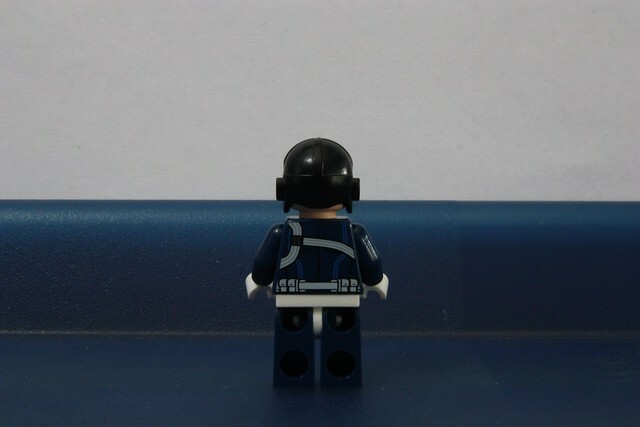 It also informs us of the inclusion of a Super Jumper, and a little demonstration of how it works. Down in the bottom right hand corner is an advert for the new Marvel Game. 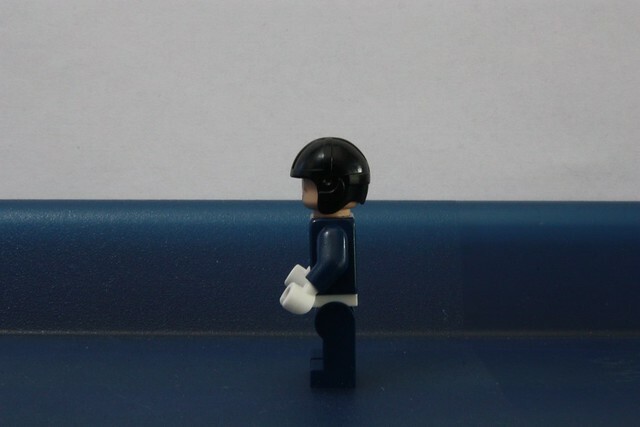 The top of the box gives the standard 1:1 scale for your figure. Inside you get two unnumbered bags, one folded instruction manual and a very small sticker sheet. 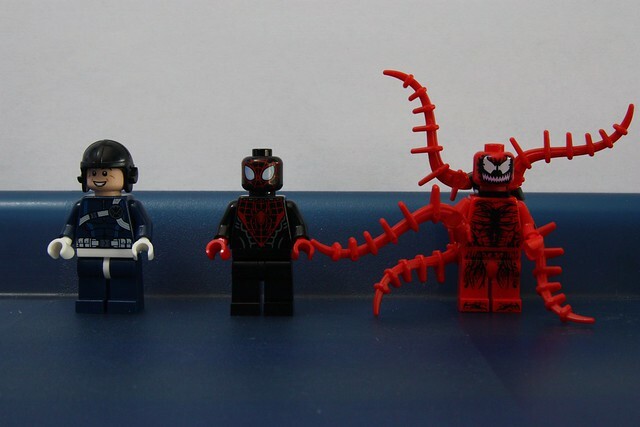 The figures, from left to right, the SHIELD Agent, Spider Man and Carnage. The printing on this figure is brilliant, and I was happy and surprised to see printing on his arms too. It's a shame that the back printing is covered by the neck bracket. Again, he features very nice printing, yet I was disappointed that his arms are plain, why did the arms from Maria Hill not get used. He would look a lot nicer with the SHIELD logo on his arm in my opinion. 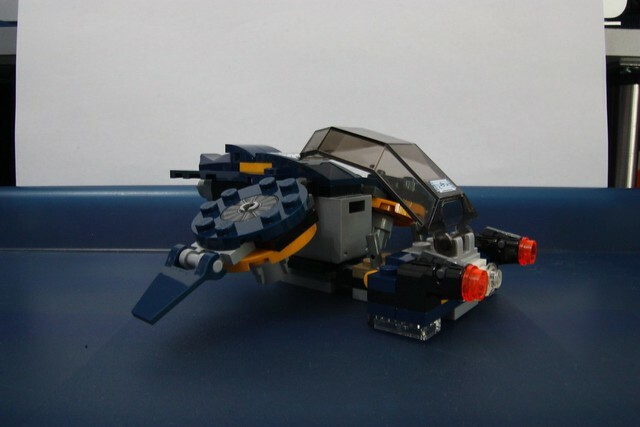 Lastly, it's the little SHIELD hovercraft. 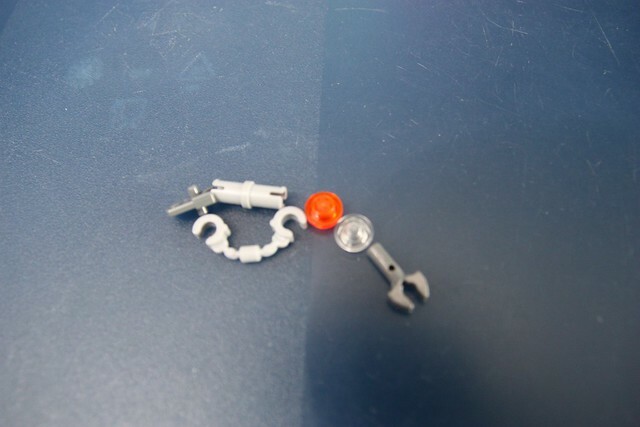 I love this little thing, its 100 times better than the build from Iron Man vs. Ultron. 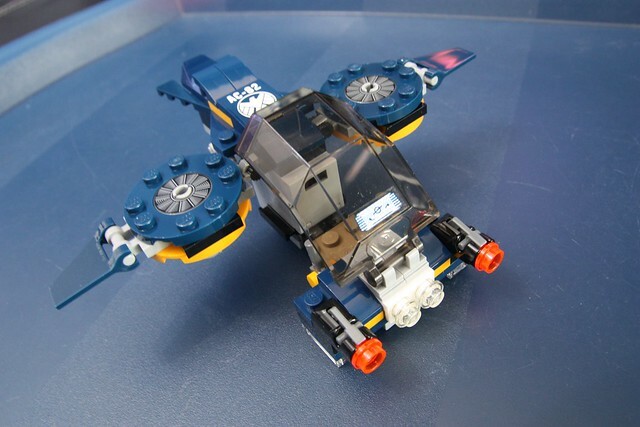 I can imagine having six of these flying around a Helicarrier with Venom and Carnage attacking them all. The small 2x2 round tiles with the fan printing are lovely and I can see those, plus the SHIELD Agent being a good enough reason to pick up multiple copies of this set. The characters have a few flaws but these are personal opinions, and hardly detract from the set at all. I would take this over the larger Spider Man set released this year any day, yet I'm in it for the figures so I'll probably stilled up getting that one too. Hope you've all enjoyed my second review on here, and please feel free to add any additions to this review that you have! Nice review! I agree, this is an excellent set! 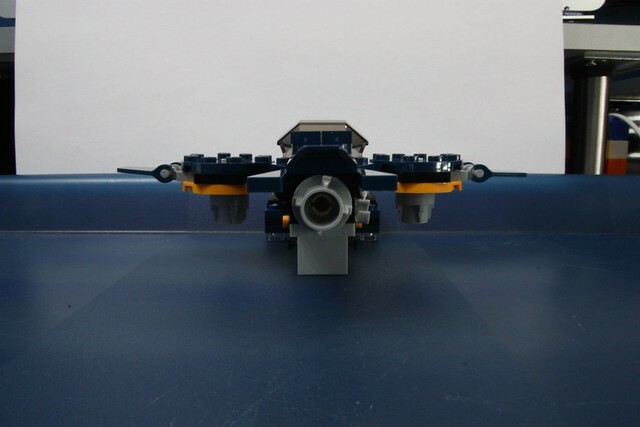 It is an awesome set. I do also wish that the SHIELD agent had Maria Hill's arm printing. 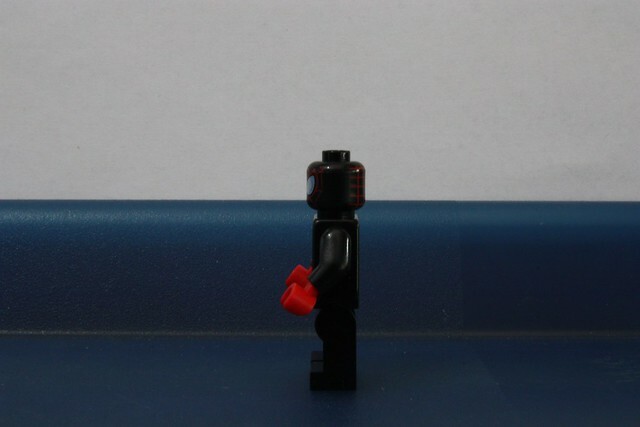 Either way, I will use the agent's torso and legs for Nick Fury. 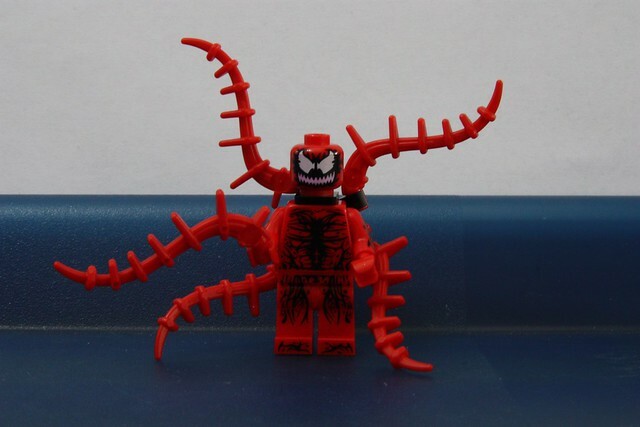 Also, I will give Carnage some black hands, I think he could use some more black. 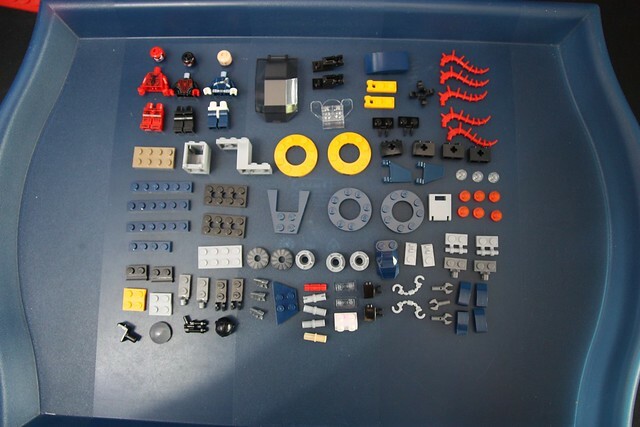 Nice review, and this seems like a decent set. 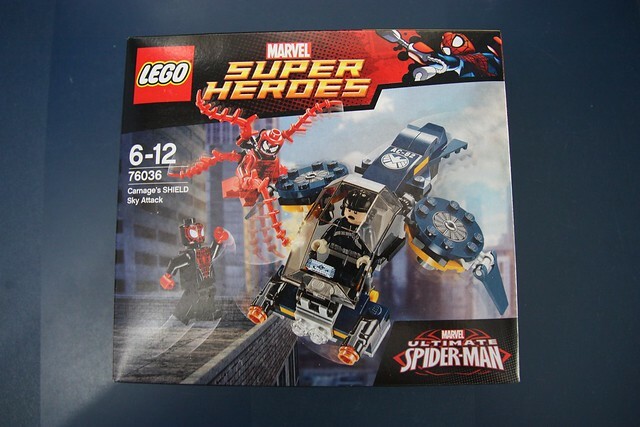 Does anyone know the official release date for this set in the U.S.? Really like this set. But I wish they had made the rope piece in red for carnage. I realize this is a Marvel set and Nick Fury certainly could use all around head printing, but he isn't the only one that suffers. I'd go so far as to say Bane from Dark Knight Rises would actually benefit from all around head printing even more than Fury. 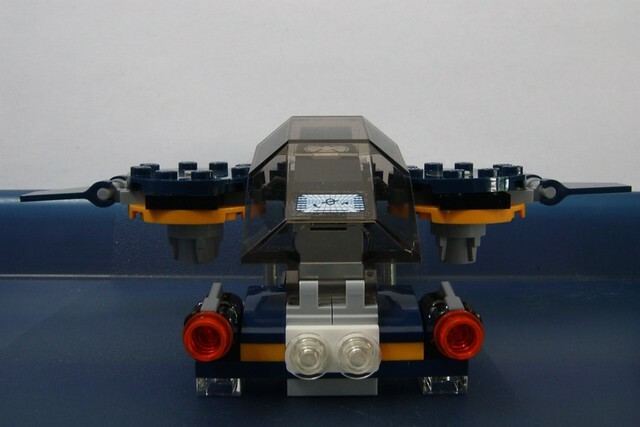 With that said, the set looks decent enough for the price. I will pick one up for sure to pad my collection. 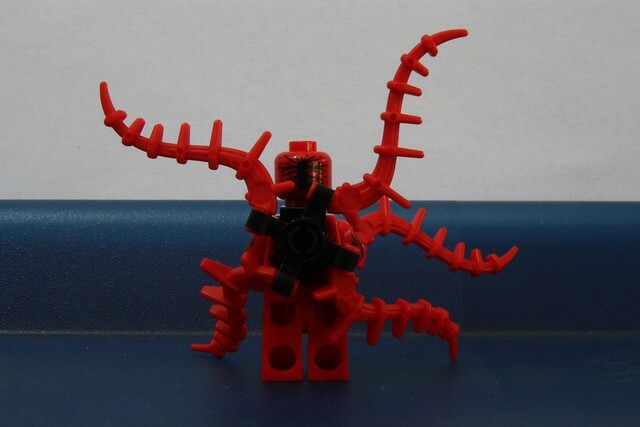 I don't know anything about this version of Spider-man. The Carnage figure is outstanding! Great set! Great rewiew!